You can set your tax rate on the govern screen. Increasing the tax rate will decrease your Civilization's morale. You can decide if you want your GDP to remain in the hands of your citizens, or go toward supporting your latest war effort or infrastructure project. Note that high taxation does not effect the morale of synthetic species, feel free to give everything to government when playing the Yor. Extreme planet frequently increased substantially. AI is more likely to request tribute. New AI evaluation system for deciding when to build large ships vs. small ships. AI now updates its ship blueprints when a tech is researched rather than every N turns reducing turn times and making the AI smarter. AI is more willing to talk to players it doesn't like. AI will talk more to you regarding your evil immoral ways. Made AI "dumber" on lower difficulty levels. Slight HP adjustment on genius AI. AI will give extra defense coverage for its capital world. AI is better at stationing defenses around key worlds rather than spreading them evenly. AI a lot smarter about trading resources with player to match marketplace pacing. AI defends worlds a tiny bit better. Weakened AI fleets will now intelligently regroup behind the lines to reform larger fleets rather than fight to the death. 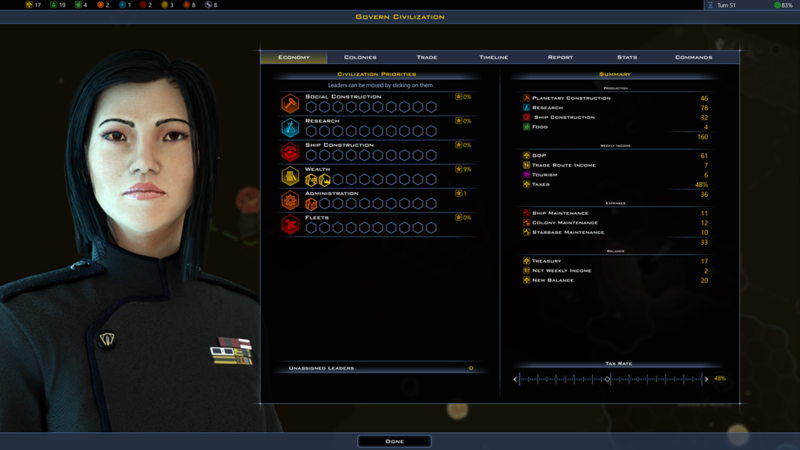 AI Supreme Commander now looks at fleets as pieces of a much larger task force. Proclaiming friendship with someone will make their enemies dislike you more. AIs that want to go to war who are running a government that can't go to war will switch to a form of government that can declare war upon their next opportunity so that they can declare war. Small adjustment to the weighting of transport ships so that the AI is more likely to build them if it has none of them at all. AI more likely to place legions on important planets. AI more likely to rush defensive ships if it feels it is threatened. Tourism buildings converted to the new system. Balance pass on ship hull maint. Reduced starbase maintenance on early modules. Reduced starbase mining output to be more balanced. Update Culture Traits and Improvements to be the same in Base as in Crusade. 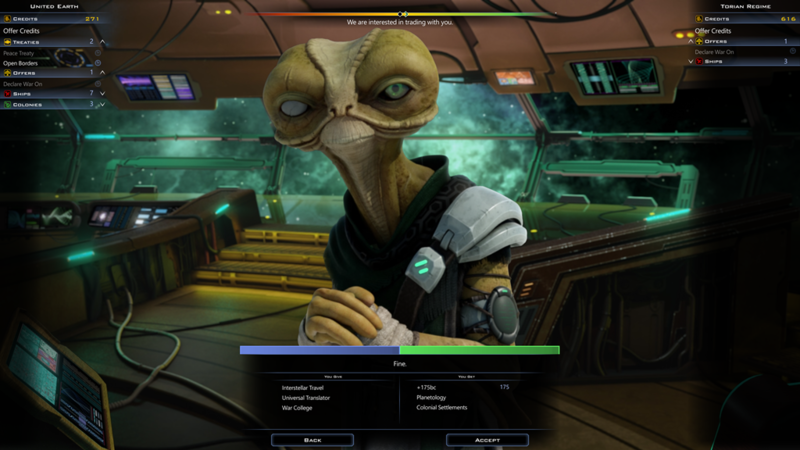 Adjust Biosphere Perfection description to be more generic, since the planets unlocked are now dependent on the race type. Balance pass on ship designs for the AI to generate better ships. Combat Rating adjustment to be more accurate. Phasor effect is blue-ish instead of green-ish. General moving around of improvements in the tech tree to reduce the number of improvements early game to just ones that the player might actually use. Increased the weighting of HP when determining starship strength. Move Solar Power plant to be unlocked by Advanced construction in base game. Added checks to diplomacy system to make sure that you can't offer non-aggression treaty to ally. Moved Planetary Invasion up in the technology tree so invasions can begin earlier. Shared borders diplomatic penalty increased but greatly decreased for certain personality types. Added a new popup giving a brief overview of 3.0 features. Minor tweak to music for planet window. Approval rate displays as a % on the top right instead of just an integer. Tweak text in the Production window tutorial description to reflect button title change to Civilization. Adjust size of the Anomaly Window to fit longer anomaly descriptions and bonuses. Power consumption tweak for Surface Pro users. Broad reduction in memory requirements. (didn't touch the really big map sizes so the lunatics -- you know who you are -- won't murder me). Adjust size of Anomaly window to fit longer anomaly descriptions and bonuses. Crash fix for the case where a personal transport is using a ship design it can't find. Crash fix for the case where a ship design is missing a component. Fix missing sort descriptions on for some of the Generic Tech Specializations. Fix for crashing events that spawn ships in a player's territory. Fixed issue where the loading window was not unhiding whenever starting a multiplayer game as the client. Happy People mercenary nerfed. Provides 3 morale instead of 5. Fix assorted mis-matched descriptions on the mercenary ships. AI more likely to have garrisons on planets. Shared borders without a treaty has greater negative relations impact. Farms no longer have a maintenance cost. Snuggler Colony gives approval bonus to adjacent tiles. I mean, they're snugglers after all! Lots of balance changes to make the technology tree progression more responsive to the player. Brutal soldering benefit changed to a %. Ideology cost goes up equally in all categories to encourage players to pick an ideology and stick to it. General balance pass through the improvement tree to reduce the amount of resources needed to go with the recent reduction to the mining capabilities. Legions only require Durantium to train. Most galactic achievements or special improvements now require an exotic resource. Defense since the Planetary Defense stat is no longer used in Crusade. Removed the pointless enhanced training specialization tech group. Tweaked the preference weight of the garbled text so that other garbled text options have a chance of being used. Manufacturing Capital now provides a +5 level to adjacent tiles instead of 3. Reduced growing tech cost slightly. Mission reward for treasure hunt max reduced from 500 to 300. Upgraded colony capital morale given +1 more. Fixed invasion crash due to not having enough swarm particles. Balance pass on Crusade Improvements. Custom factions can now get the "Overlord"
Reduced the factory production bonus slightly. Exploration Treaty moved earlier in the tech tree. Fixed a lot of incorrect text descs on the precursor anomaly (says it gives 500 research when it actually only gives 300, etc). Lmfao - Fixed a clogged toilet on Drengi, wth? Some of the fixes/additions are repeted in the OP. can a black hole be "plunged"? Or will the black hole plunge you? Can't wait for that ! So... is Arable Land supposed to be in the base game or not? I've commented on its absence several times over the past month, but nobody seems willing to acknowledge it long enough to say "noted, this is/isn't a bug". I'm not sure what I should think about 3.0. The complete planet building, farm and money mechanic looks like you try to make the game very easy and much complexity is gone. Now you need not to develop planets in any direction like food or money so every planet has enough place that I can build all I want? Tactic and complexity gone! I don't like that idea... Because Gal Civ 3 is the game which lives from complexity... I can't believe that there is a fan who like a very simple game concept especially in Gal Civ III...! Am I right? In other case please correct me because I hope I'm wrong!!!!! I do not agree with you. It is a completely different mechanic, now. I have started many games, with different racial options. I have gotten a home-planet and my second 2 with no food. Priorities shift now. How to direct my economy? If you think it is too easy, go up a difficulty level. The AI changes have made me go down one, just to learn new mechanics. if you still want "free food" go aquatic. Hydroponics can be built like old farms. Its a quiet simple mechanic. In my current test game at turn 200 I have the AI is really good. Drengin as my neighbor's are very aggressive in that's a lot of fun. I have 11 planets and two of them have no food tile. Some have 2 and one has 3 tiles for food. I have very much food and its not important to do anything for food. I have more place on my planets as I need at moment and more money than I need at the moment. And exactly that's the problem There is no strategy needed for money and food... No strategy needed what I build on the planet because there is enough place. The only thing I have to think about is expansion and the war against the drengin at the moment. And while there is no other problem I have to do something for it is really easy the manage the few little problems. I really really don't like this simplifying of a game where the biggest marketing argument was the complexity! Well I have been giving the v3.0 beta a good crack lately. Just wanted to post a few observations. First off the AI is much better. Their planet builds and fleets are much stronger. A few things I don't like still. They spam so many ships it is just not funny. Current game turn 150 with 2-6 planets each and they all have between 200 and 400 ships. Still there is WAY too much emphasis on pure military for both score and relations and proximity be damned. I've had declarations of war from belligerent AI (over 300 tiles away) who are behind with production, economy and tech simply because they have a few more ships giving them an extremely false sense of superiority. Just as ludicrous, late game I can pump my overall score and military rank from from dead last to first within only a few turns building a handful of ships. Also, why is the AI obsessed with building a SB on the mercs? I have to ring my bazzar so the AI cant squeeze a base in. A side note for the AI. On godlike difficulty the AI improvement seems to have really snowballed. It may be just the way I play and I need to adapt or drop difficulty down, but it is a real struggle to just keep up now that I am hamstrung by the pop cap. I can go into details if anyone wants but needless to say the AI bonuses are massively amplified by their better game play. I would be interested to know how others fair on the harder difficulties. Also the new farming system. I have to admit it is great to see the AI making great use of it and populating their planets. But on the negative side it is extremely restrictive. Even more now than ever, unless you have monsantium (for Kimberly's Refuge) it is hard to make large amounts of food. That said, food is now not that important as I seem to hit pop caps everywhere. These limitations on pop make it near impossible to keep up with godlike AI, let alone compete. Pop already had a soft cap with morale so this new dynamic is a huge fail. Lastly I want to comment on the new economy. Tourism is overpowered now to the max. The more I play, the more it seems I should push my culture growth and economic bonuses to just rush buy everything and trade for tech. Having 20k a turn income is nothing to sneeze at but very easy to achieve without breaking a sweat. Having pop capped means you run full tax with excess morale. A few economic and tourism buildings and a few culture starbases are all you really need to set things in motion. Push it along with economic SB and culture buildings and income becomes insane very quickly. But to be honest, my economy is the only thing that keeps me in the game (not competitive I might add). So in finishing I am torn about this update. I love the AI but hate the farming/population restrictions. Also, is it a bug or a mistake or by design that the Snarthi get a very early tech (first scavenging tech from memory) that gives a full +1 to mining (1000% more than other comparable techs)? 1. Minors - will they get finally at least some sort of rework with Intrigue? Maybe they can become part of your commonwealth...? 3. Economy - isn´t this too dumbed ("streamlined"), with recent tourism etc. changes and removal of some economic buildings? What pop caps are you talking about? I haven't played 3.0 beta, so I would appreciate it if you could elaborate. In 2.8 the planet's class provides a hard pop cap, which can be reached by building cities. Does 3.0 introduce additional pop caps below the planet class one? I do find food to be much more scarce now, so I'm taking better advantage of city adjacencies to hit pop cap. +2 from AL is quite nice. Don't forget that the Aquatic civs still have their Hydroponic Farm (+3 +0.1/adj ) which can be built anywhere. I often destroy AL as aquatic, once I get the tech, unless I need the AL's adjacency bonus. Ok then. Hardly played 2.8 so I missed that (was off swimming with leviathans) . Yeeesh, I am surprised that people liked the pop cap. So harsh! Early/mid game with planet raw running at +65% and research running at +265% I am getting smashed tech wise against godlike AI. Trading like a fiend scrambling like a mofo just to keep up with the mid tier opponents. Got hemmed in hard in the colonisation rush (ran straight into 3 home-worlds) so stuck with only equal amount of planets and this pop cap effectively has destroyed any chance of a tall build. I may have to give serious consideration to biting the bullet here and restarting with easier AI, I am struggling to compete against their insane bonuses now. Either that or just abandon benevolent as a viable ideology. Thanks you two for clarifying that. Guess you're not supposed to win from a bad starting position against Godlike AI. In my understanding Godlike is meant as the ultimate challenge: a powergaming-only-no-roleplay-zone, where you have to use all the cheese you can come up with and every exploit that is not clearly based on a bug to even have a chance at winning. In addition to playing to your very best ability, of course. Oh, it's Kael the FfH guy from Civ4 - I just noticed. Interesting. I am a huge fan of FFH/FFH2 and it was Big News when I heard that Derek had joined forces with Stardock to help make even more cool stuff. Maybe you were just extra busy in 2010? Following Fall from Heaven, I had the opportunity to come join the amazing team here at Stardock. I've been here for about 7 1/2 years now and I've loved ever minute of it. I've been able to work with strategy greats like Brad on internal projects and be able to work directly with Soren Johnson in publishing his game, Offworld Trading Company. I read absolutely nothing on Fleet control. I'm new at III but played a lot of II. So, after spending over 10 hours, I have now figured out how to create the fleet I want and disband a fleet. Of course this isn't in the tutorial or the Wiki or the Manual. Manage doesn't work. Command doesn't work. If you have a tile that is composed of a single fleet, you have to click on one of the tiny, really tiny ships in the default display screen and the eject comes up, which has to be used and now you have a fleet plus a solo and the fleet commands now work. Dunno why Stardock didn't just use the workable and viable way fleet commands worked in GC II. The game updated, and I loaded my current empire - one of those massive universe ones where I'm using it as a playpen - lots of planets and starbases, the rest of the empires cowering in the corner. First thing I notice is that my influence has expanded substantially - most of the map is now blue - an increase of probably 60% over where it was - filling in most of the blank areas. I complete my turn, and now my credit balance is negative (from 270K down to -200K in one turn). I go into the economy tab and do some research. My tourism income is -470K. I click on the tourism number and it expands and shows me a bunch of planets with very large numbers ~500K income each, with one at ~2M. It's pretty obvious that the total tourism income (sum of all of these) is wrapping from positive to negative. It's also pretty obvious that the tourism income values are probably way out of whack.